A My Chronicle Book Box review: Lies Sleeping by Ben Aaronovitch. The seventh novel in the Rivers of London series series the final showdown between Apprentice wizard Peter Grant and his long running nemesis the Faceless Man! 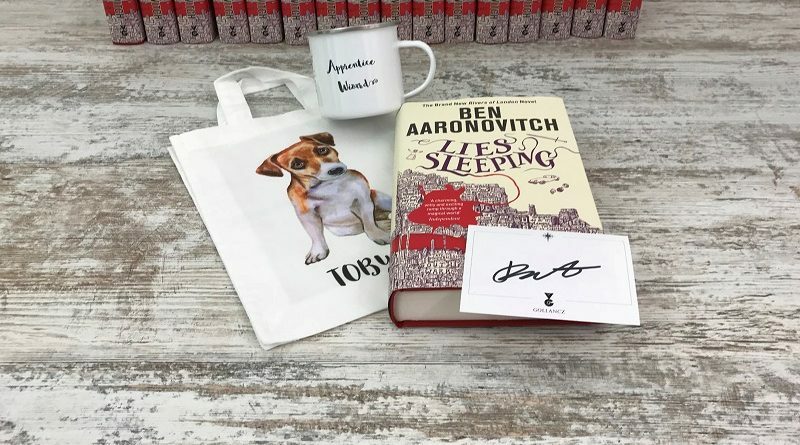 To celebrate the release of this book we have put together a special edition of our book box which contains the novel, signed bookplate and Rivers of London inspired goodies. Order yours here. This is one of my favourite series, a wonderful mix of urban fantasy, police procedural and wry humour. This is the seventh novel in the series and we see Peter and Nightingale finally running down their nemesis, the Faceless Man aka Martin Chorley, unsanctioned wizard and psychopath. Not by themselves though, Peter has just been promoted to Detective Constable and Operation Jennifer to take down Martin Chorley and Lesley May has the full might of the Metropolitan police force, including overtime budget, behind it. DC Sahra Guleed is one of my favourite characters and she also has a key role in the operation and there are some great developments for her in here. As a result of the magical protections in place in the Folly proper, Operation Jennifer is being run from a portakabin in the year courtyard, and Nightingale and Seawoll are just about managing to be civil. The book takes us right back to the themes of the original Rivers of London novel too, with Peter having to confront the malevolent spirit Mr Punch who changed his and Lesley's lives forever. If you love Rivers of London as much as we do, or know someone who does, and is in need of a gift, check out our special edition book box.